Home / World / Trump: date and location of Kim summit "has not changed"
Trump: date and location of Kim summit "has not changed"
His comments came when South Korean President Moon Jae-in made his first public comment since a surprise meeting with the North Korean leader on Saturday, saying Kim was still committed to denuclearization. "What is unclear to Chairman Kim Jong Un is not the desire for denuclearization, but the concern that the US, if denuclearized, can end hostile relations and guarantee the security of the regime," Moon said. Trump suddenly annulled the eagerly awaited US North Korea Summit, scheduled for June 12th on Thursday, with hostile comments from high-ranking North Korean officials and concerns over the country's commitment to abandon its nuclear weapons. 2. He added that he expected the practical talks and summit to be "very smooth". Trump said there was a lot of "goodwill" for the meeting. "Many people are working on it, it's going very well." The South Korean president met Kim late Saturday evening on the north side of the demilitarized zone (DMZ) between the two Koreas. Their last meeting on April 27 took place on the south side. During his meeting with Kim, Moon said that North Korean leaders had "once again expressed their determination to fully denuclearize the Korean Peninsula and expressed their intention to reconcile the history of war and confrontation and to work together for peace and peace North Korea US Summit. " Moon said Sunday," Our path to complete denuclearization of the Korean Peninsula and a lasting peace agreement are unstoppable, and we have decided to work closely together. " Moon also proposed that a US North Korean hotline could be opened in the future. In a statement released on Sunday before Moon spoke, the North Korean state media said the meeting had taken place "at once". North Korea informed its own people about the meeting between Moon and Kim, with reports in state media praising a "new era of reconciliation and unity." "Panmunjom, the historic land that once had come into the world spotlights as a symbol of peace for a new beginning of north-south relations and the opening of a new era of reconciliation and unity, witnessing the significant meeting between the top leaders of the North and South again after 29 days, "the Korean Central News Agency (KCNA) said. 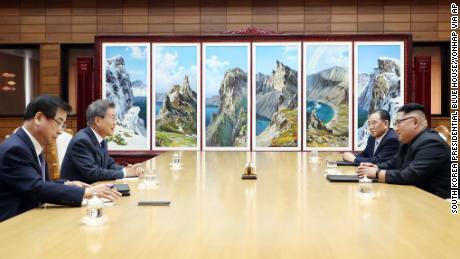 KCNA said that Moon signed the guest book at the Thongil House where the meeting took place, writing "Peace and Prosperity of the Korean Peninsula with Chairman Kim Jong Un." 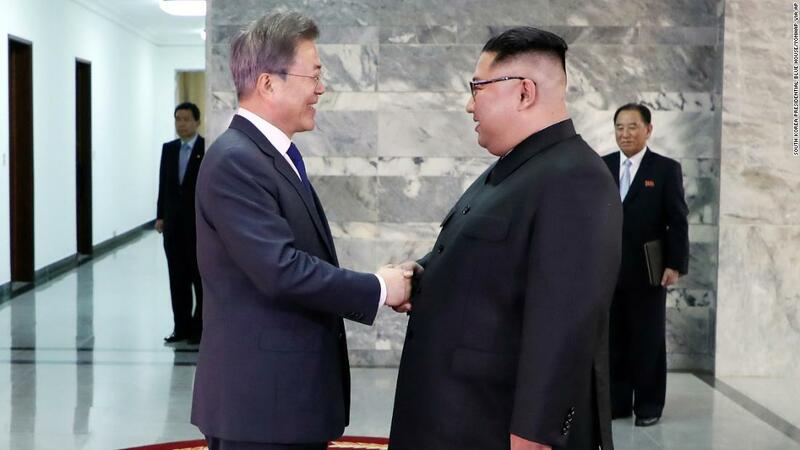 "There was an in-depth exchange of views during the talks to address the issues that were quickly resolved to implement the Panmunjom Declaration agreed at the third North-South Summit and to realize the denuclearization of the Korean Peninsula, and regional peace and stability and prosperity, "says KCNA. The Panmunjom Declaration was the result of Moon's and Kim's first meeting in April 1964, committing the two countries to denuclearization of the peninsula and talks to formally end the Korean War. Kim thanked Moon for "much effort" towards the US North Korea Summit and said he hoped to improve relations with Washington and "establish mechanisms for lasting and lasting peace." 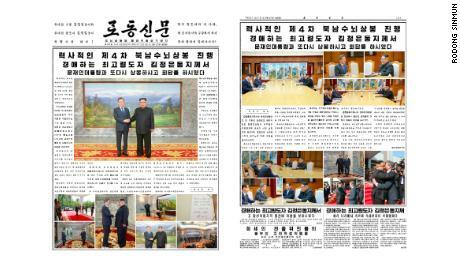 Kim and Moon's photos, which hugged and shook hands, also appeared on the front page of the state-run newspaper Rodong Sinmun on Sunday. In a tweet on Friday, Trump had said that "very productive talks" will continue at the North Korean summit. "We have very productive talks with North Korea on the resumption of the summit, which if it happens, it will probably stay in Singapore on the same day, June 12, and be extended beyond that date, if necessary," Trump wrote. Moon, who was a mediator between Trump and Kim,. Www.mjfriendship.de/de/index.php?op…=view&id=167 On Thursday, Trump summoned the summit meeting in a letter to Kim. North Korea had stated that it was not satisfied with the way things developed when there were high-level talks with South Korea about joint US-South Korean military exercises. US officials said the last straw had come for Trump when a North Korean Foreign Ministry official described Vice President Mike Pence as a "political fool," indicating that Pyongyang was ready for a "nuclear showdown," diplomacy said fail. The US also claimed in a background briefing that North Korean officials had failed to compete in Singapore to arrange logistics for the June meeting. But a North Korean Foreign Ministry said Friday that Kim was still ready to meet Trump "at any time."